This is a favorite recipe from our Doctor Yum's Preschool Food Adventure curriculum. This makes an easy after school snack and a healthy snack to share for a classroom party. If you are concerned about nut allergies, look for sunflower seed butter (which does not have tree nuts or peanuts, but make sure the label says the product is not made in a facility with nuts). Kids will enjoy spreading the nut butter or sunflower butter and smashing and sprinkling the whole grain cereal on their sandwich. Buy a variety of apples in different colors to encourage tasting new foods. 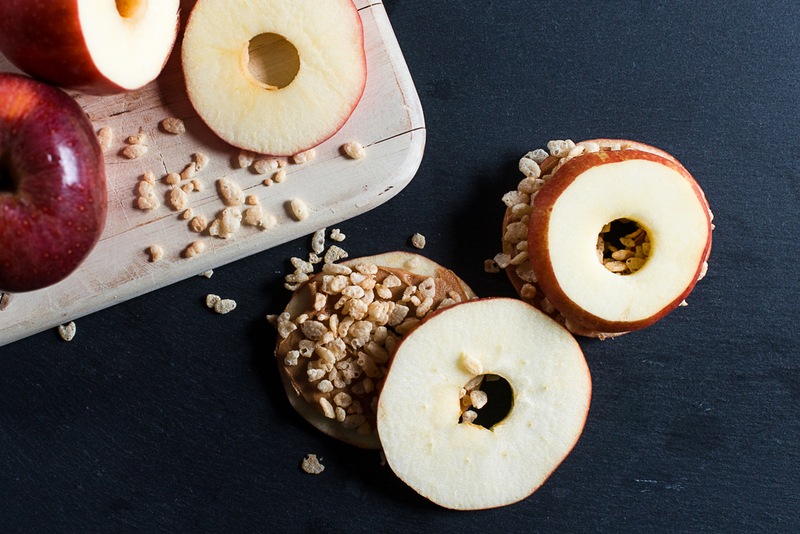 Choose a whole grain cereal with no added sugar, since the apples themselves are so sweet. Prepare apple slices for the sandwiches. If you have a corer, use that to first remove the core and then cut apples into ¼ to ½ inch slices.Keep skin on for maximum taste and fiber! To make the sandwiches, first place several scoops of cereal in each zip top bag. Crush the cereal with a wooden spoon (careful not to crush too fine). Take one apple slice and help students use their dog knives to spread about 1 tablespoon of sunflower butter (this will be hard to measure out so just eyeball). Top with one tablespoon of cereal (use tablespoon to measure). Add another apple slice on top to make a sandwich. Take time to notice crunching sounds when kids crush cereal and even as they eat their crunch sandwich!